Tuesday December 15th 1903 Still very cold. I was busy about the house a great part of the day. Did some mending. Will busy with the care of the stock. Wednesday December 16th 1903 I baked bread today and got the dinner. Will went to town in the afternoon and I went down to spend the afternoon with Mother. The girls were over to church. Lorie is quite sick. 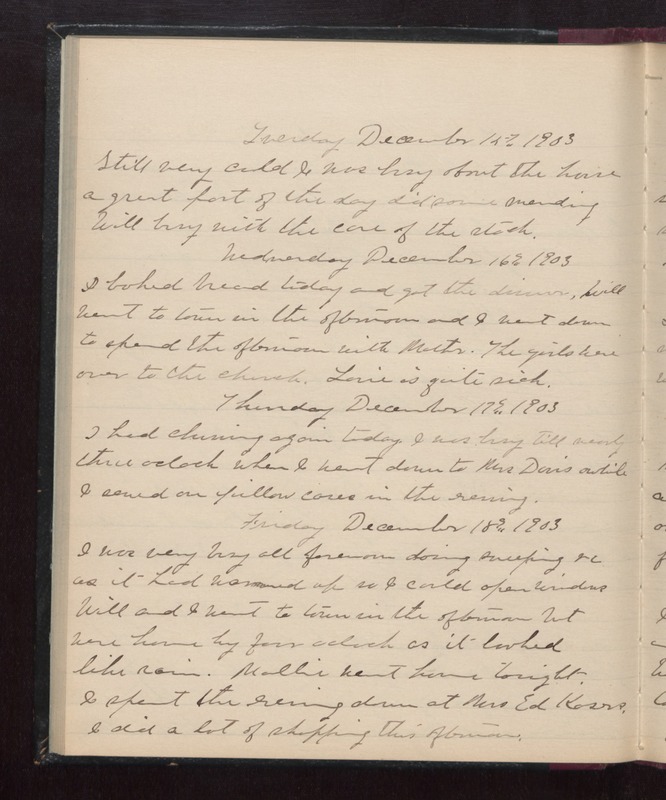 Thursday December 17th 1903 I had churning again today. I was busy till nearly three oclock when I went down to Mrs Davis awhile. I sewed on pillow cases in the evening. Friday December 18th 1903 I was very busy all forenoon doing sweeping &c as it had warmed up so I could open windows. Will and I went to town in the afternoon but were home by four oclock as it looked like rain. Mollie went home tonight. I spent the evening down at Mrs Ed Kosers. I did a lot of shopping this afternoon.